When it comes to collecting merchants ratings and reviews, the service provider you choose makes ALL the difference. For example, clients that switch to Shopper Approved from other competing services consistently collect up to 70x more ratings and reviews than they did with their previous provider. 70x more merchants ratings and reviews means 70x more social proof for your business. For SEO, the two platforms demonstrate almost the same efficiency, providing advanced tools to gain high rankings in search results. X‑Cart 5, though, has got a more convenient interface for managing SEO settings as they are located in a separate section in the store back‑end. Also, to the difference with X‑Cart 4, it has a better structure of product URLs. Thus, its subcategory path includes all parents categories and subcategories names. It is good for SEO, as the URLs contain additional keywords and it helps the search engines to categorize your content. Customer Ratings and Reviews have been collected in the last 30 days. of all ratings in the Shopper Approved are either 4 or 5 star ratings. Total Ratings and Reviews have been collected since 2010.
of all ratings in the Shopper Approved system are 1‑star ratings. out of 17579 of our client’s customers surveyed said they’re more likely to buy from a website that displays the Shopper Approved Seal. We never use money, prizes, or gifts to gather or influence ratings. Trusted 3rd party Merchant Ratings and Reviews from Shopper Approved are one of the most powerful sales tools you can add to your website. 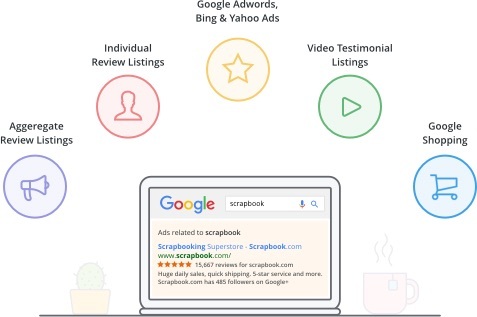 Shopper Approved merchant reviews can be added anywhere on your website with a simple line of code to give you the social proof you need to stand out from your competitors and make more sales. Now, just like Amazon, you can have compelling, informative product reviews beautifully displayed next to each of your products. Shopper Approved Product Reviews are an incredibly powerful form of social proof, and are often the deciding factor when customers are considering buying a product from you instead of your competition. Only companies that syndicate their product reviews to Google can display 5‑Star Ratings in their Product Listing Ads (PLA’s). As one of only four Google Authorized 3rd Party Product Review Aggregators based in the United States, we can help you display 5‑Star Ratings in your Google PLA’s and in Google Shopping. We can even syndicate existing Product Reviews you’ve already collected. Shopper Approved product reviews have several unique features to get you faster results. 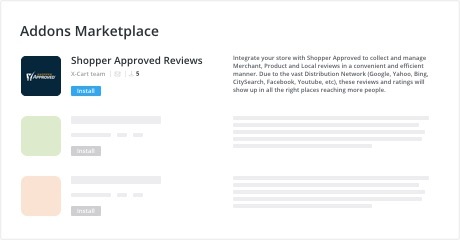 For example, when starting out, you can temporarily display merchant reviews until you’ve collected enough product reviews for a particular product. Also, you can collect both merchant reviews and product reviews in the same survey; greatly simplifying the entire review process. With the click of a button, you can integrate Shopper Approved into your website in all the right places. This includes both Merchant and Product Ratings and Reviews. It’s never been easier to collect and display reviews like the Pros.